The Migration Period, which also known as the Barbarian Invasions or, Völkerwanderung (wandering of the peoples), was a period of human migration that occurred between c. AD 300 to c. 700 in Europe. These folk movements mark the transition from Late Antiquity to the Early Early Medieval Period. 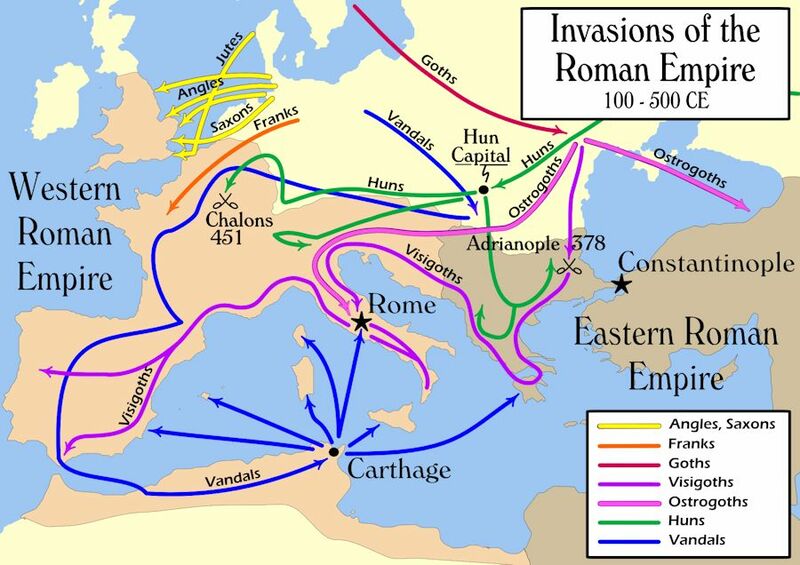 These migrations were brought about by major changes within both the Roman Empire and the so-called 'barbarian frontier'. Migrating peoples during this period included the Huns, Goths, Vandals, Bulgars, Alans, Suebi, Frisians, and Franks, among other Germanic and Slavic tribes. The migration movement may be divided into two phases: The first phase, between AD 300 and 500, put Germanic peoples in control of most areas of the former Western Roman Empire. The Visigoths were the first to formally enter Roman territory. They came in 376 as refugees from the Huns. They were accepted on the grounds that they would defend the Danube frontier. However, they rebelled, eventually invading Italy and sacking Rome itself in 410, before settling in Iberia and founding a kingdom there that lasted for 300 years. The Visigoths were followed into Roman territory by the Ostrogoths led by Theodoric the Great, who settled in Italy itself. In Gaul, the Franks, who were a fusion of western Germanic tribes whose leaders had been strongly aligned with Rome, entered Roman lands more gradually and peacefully during the 5th century, and were generally accepted as rulers by the Roman-Gaulish population. The Franks held off challenges from the Allemanni, Burgundians and Visigoths, and the Frankish kingdom became the nucleus of the future states of France and Germany. Meanwhile, Roman Britain was more slowly invaded and settled by various Germanic tribes, including the Angles and Saxons. The second phase of these migrations took place between AD 500 and 700 and resulted in Slavic tribes settling in Central and Eastern Europe, particularly in eastern Magna Germania, and gradually making it predominantly Slavic. The Bulgars, who were a Slavic peoples, possibly of Turkic origin who had been present in far Eastern Europe since the 2nd century, conquered the eastern Balkan territory of the Byzantine Empire in the 7th century. The Lombards, a Germanic people, settled northern Italy in the region now known as Lombardy. Migrations of peoples, although not strictly part of the 'Migration Age', continued beyond AD 1000, marked by Viking, Magyar, Moorish, Turkic and Mongol invasions, and these also had significant effects, especially in Central and Eastern Europe.